We offer a broad range of cost-effective damp and property preservation services for clients in Dorset and Hampshire, including mould removal, damp treatment and DPC installation. When it comes to protecting your home against problems with damp, Croft Preservation are your number one choice. Our team of accredited damp specialists have the industry knowledge and experience required to deliver excellent and long-lasting results. Contact our damp and property preservation experts today on 01202 737739 to arrange a damp survey of your property and take your first steps towards fixing your damp or infestation problem. Damp problems like dry rot and wet rot, as well as woodworm infestations, can cause irreparable damage to the timber structure of your property - if left unchecked, this can become a significant health and safety hazard. Timber structural repairs are important if you want the overall strength of your building to remain assured, and to prevent the same problem from happening again. 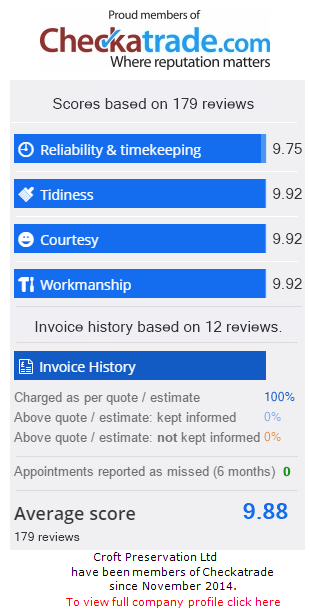 As a local company with a great reputation for customer service, you can rest assured that if there isn’t a problem, we’ll tell you! Our company values hinge on total honesty and customer saftisfaction, so we won't ever charge you for unnecessary works. For professional damp proofing, damp repair and damp treatment services, as well as a range of other property preservation projects such as woodworm treatment, don't hesitate to contact our team today on 01202 737739 - we look forward to working alongside you!